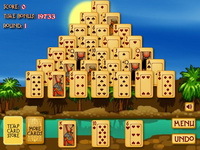 Description: Kitty Tripeaks is a classic solitaire variation with bright graphics. While owners are at work the kittens are playing tripeaks. Dedicated to all pet and solitaire lovers! Twenty skill levels and excellent graphics make this game even more exciting.